Amani Restaurant is a new facility in an existing building. So there is proposed a new sign on the building facade. Hassane Oseili of Quality One Construction is the contractor for Sign-Installation-on-Facade-of-Amani-Restaurant-in-Dearborn-Michigan. 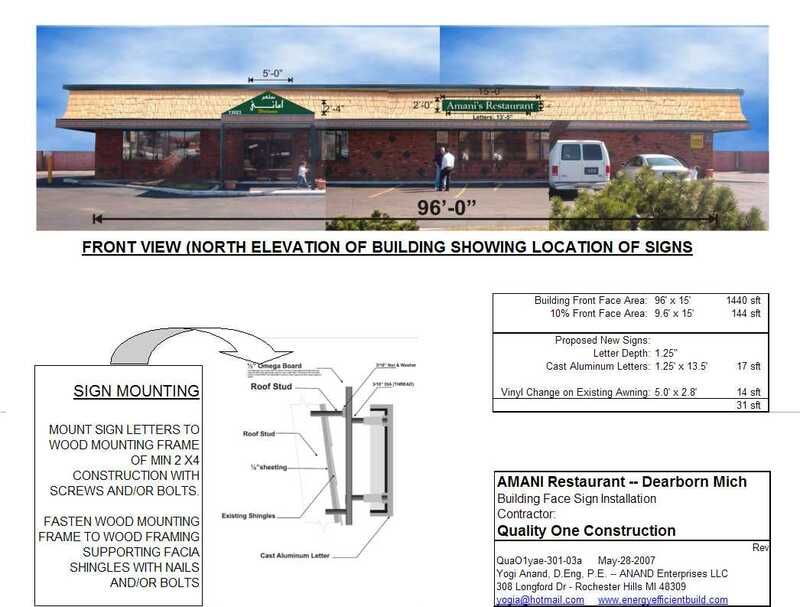 The sign installation drawing has to be submitted to the City of Dearborn for procurement of building permit. The sign will be installed on the North face of the building -- the sign will consist of Aluminum Channel Letters. I am proposing mounting the Channel Letters to a mounting frame. The mounting frame will be then fastened to the structure of the facia shingles. Additinally there will be a vinyl letter sign on the Front Entance lobby. There is also a Pole Mounted sign -- I will talk about that in anoother post. In the following I present a schematic of the layout of the sign. I will present more pictures and details later.